When it comes to smartphone screens, there are two predominant technologies—the traditional LCD panel, and the newer AMOLED display. Most phones still use LCD screens, as the tech is more cost-effective due to its longstanding reign as the primary display type in TVs, smartphones, and tablets. AMOLED screens are more energy-efficient, and offer higher contrast levels and deeper blacks. But in recent years, AMOLED screens are starting to take over as the technology matures and becomes cheaper and more reliable. The advantage of an AMOLED display is that each pixel emits its own light, meaning a separate backlight is not required. As a result, when compared to LCD displays, AMOLED screens are more energy-efficient, offer higher contrast levels and deeper blacks, but are more susceptible to screen burn-in. While most smartphone manufacturers market the display resolution in their devices, not many advertise whether they are AMOLED or LCD. And with Apple recently rumored to be making the switch from LCD to AMOLED in its iPhone 8, there will surely be some confusion on this front. So if you're curious as to which display technology your smartphone uses, I'll show you how to find out below. The first method you can use to determine whether your phone has an AMOLED or LCD screen is incredibly simple. 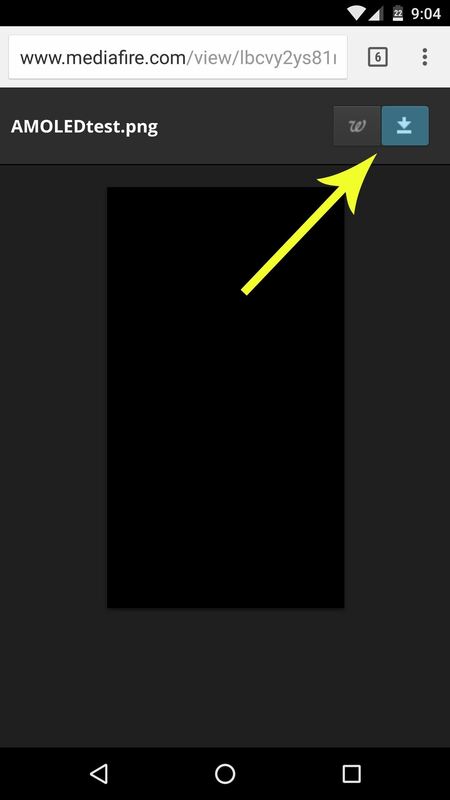 As I mentioned earlier, the pixels in AMOLED screens emit their own light, which means that black portions of the screen are areas where the pixels simply aren't lit up. Therefore, an all-black image displayed on an AMOLED screen shouldn't emit any light at all. To try this method, start by downloading the all-black AMOLED test image below. Then, once you've saved the picture to your device, open it in a full-screen image viewer with the status bar and navigation bar hidden. If you don't have a full screen image viewer, use any of the apps in this list. A black image displayed on an AMOLED screen shouldn't emit any light. Next, turn your phone's brightness all the way up, then take the device into a dark room. If you see any light emanating from the phone—any light at all—your device has an LCD screen. Otherwise, if your screen is completely dark while displaying the test image at full brightness, you've got an AMOLED screen. Nexus 6P with AMOLED screen (left), iPhone 6 with LCD screen (right). 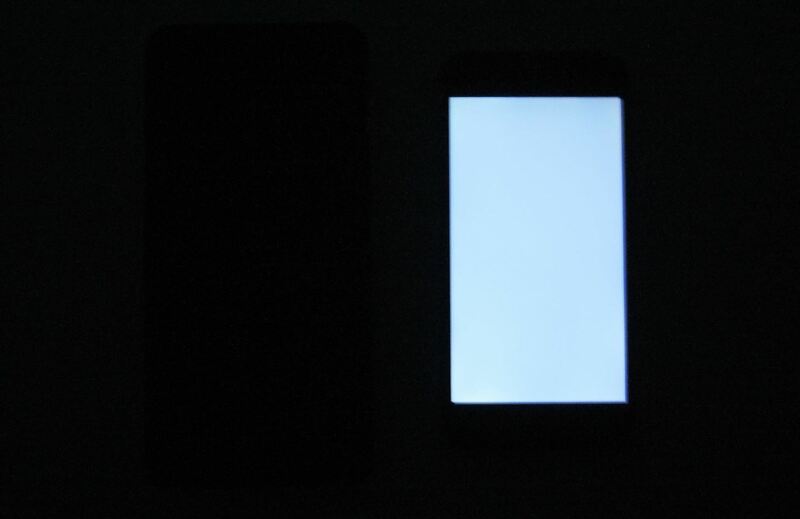 Both devices displaying the AMOLED test image at full brightness in a dark room. This second method isn't quite as fun, but it's a bit more precise. To start, simply head to GSMArena, then search for your phone model. 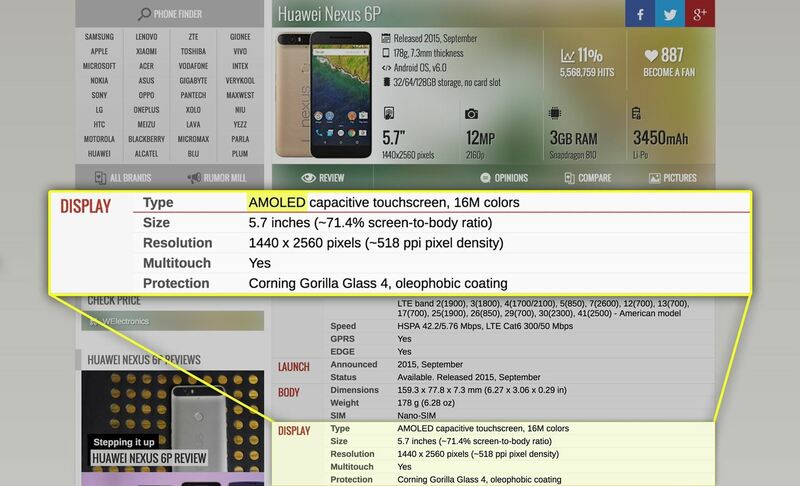 Once you've arrived at your phone's spec page, look for the keywords "AMOLED" or "LCD" under the Display category. Simple enough, but like I said, not quite as fun.